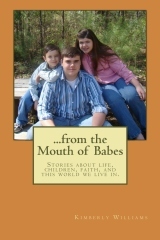 I recently finished my third book, From the Mouth of Babes. The review are trickling in and it has been a humbling experience. I wanted to share a few of them with my faithful readers. Over the past year I have had many opportunities to review various books, curriculum, music, and such. It is an honor when a person asks you to take a peek into their work and offer your honest opinion. But like anything else, until you have walked on the other side, you cannot comprehend all it holds. Unless you have done it, it is hard to understand what it is like to pour yourself into a work and have others critique it. I greatly appreciate the time and engery from these reviewers.